Here comes another extra-ordinary movie originally and first published in a social media community Wattpad written by WhoIsThisGirl. Diary Ng Panget is a romantic-comedy film proudly brought to us by Viva Films starring James Reid, Yassi Pressman, Andrei Paras and Nadine Lustre. 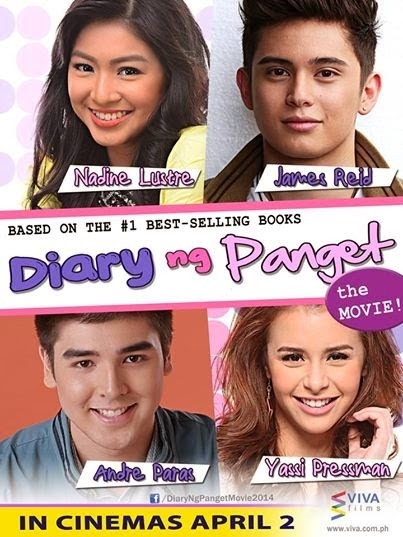 Diary Ng Panget was shown last April 2, 2014. This is a young love story of an ugly girl named Eya (portrayed by Nadine Lustre) who owned the secret diary wherein she writes every happening of her life at school. She’s been dreaming of becoming a Royalty from England and a direct descendant of Queen Elizabeth. However, due to misfortune, she was forced to look for a job in order to sustain her needs. She applied as a housemaid to a rich family where Cross resides. Cross (James Reid) was a rich kid and has one of the most handsome faces in school. He is very rude and spoiled. Cross is called the “Crush ng Bayan”. Every girl in the school likes him, especially Lory (Yassi Pressman)—Eya’s half British BFF. Eya likes Chad (Andrei Paras)-a certified cutie who’s very much in love to Lory. Eya likes him. Chad courted Lory for almost a year, however Lory love someone else-Cross. Eya continuously worked as an alalay of Cross and eventually they became friends. This is a crazy love story. Who can tell that you’ll unexpectedly fall in love to someone who you know, who will never fall in love with you!? That’s really crazy! Catch their cute stories everywhere!"